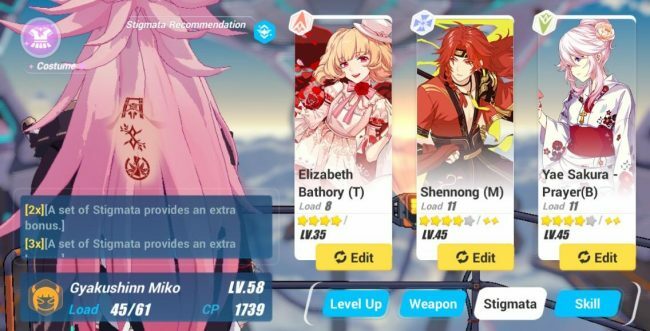 So, you want to master Honkai Impact 3rd? Do you have what it takes? No? Good. Then stay here a while and listen in, because this is the Chad Zone, and there’s room here for you. Now before we begin let’s talk about some of the core features that shape the way the game runs. Most importantly (seriously, it means the difference between victory and tragic defeat) is the Enemy Type(s). Character type and Enemy type are one and the same, but apply to two different things. Knowing and memorizing the Types is absolutely key in deciding your skill level, as well as your rate of success. It won’t be quite as important early on while you’re still learning it, and when you don’t have many Valkyries to begin with, but from Mid to Late-Game, its influence cannot be overstated. You need to know what-counters-what, and which enemies, as well as which Valkyries are what type. Notice the “>” – that indicates what-counters-what, as mentioned previously. Mecha beats Creature, Creature beats Psychic, and Psychic beats Mecha. Fighting an enemy of the same type as you won’t produce any significant bonuses or reductions to damage, but it will make you less capable at breaking through enemy Shields. For that, you would need a heavy-hitting attack like Himeko in order to help negate the disadvantage and deal more damage to the shield. Speaking of fragments, what are those, anyway? That’s easy! They’re fragments. Collect enough of them, and you can exchange them for certain rewards, such as Valkyries or Stigmata. There’s a lot about them left up in the air story-wise, but there’s a Manga published by MiHoyo illustrating the story of Honkai and Stigmata if you’re curious as to the details. As far as the game goes, they’re vital pieces of a Valkyrie’s equipment set, and boost certain stats (as well as grant different qualities or abilities) accordingly. Unique sets of Stigmata can be collected to gain bonus Set Skills, and typically grants up to two Set Skills, one for each matching addition to a set. (I.E., if I have two Yae Sakura “Dream” Stigmata, I get one special Set Skill, and if I have all three equipped on one Valkyrie, I get a second.) Paying close attention to the Stigmata you have equipped on your Valkyries can really help you, especially in the long run once you unlock the 5-star sets. Each Stigma grants different bonuses, but usually every Set follows some straightforward guidelines, such as having one Attack-oriented, one Defense-oriented, and one Hybrid Stigma per Set. Equipping Stigmata only for set bonuses isn’t always a good idea, though. For most, there will always be a better option to replace the Stigma you already have, and sacrificing the primary stats (ATK, DEF, CRT, SP) just for the bonus usually doesn’t help you out as much as you’d hope. Not to say it won’t, though. Particularly if that skill is well-suited to the character’s play style. Just keep in mind a set of Three-Star Stigmata isn’t likely to be better than a mismatch of two Four-Star and one Three-Star. Another thing to keep track of is the level of Stigmata. Like weapons, Valkyries, and Valkyrie Skills, Stigmata also have Levels, and making sure the Stigmata you use are fully leveled and upgraded to the best of your ability will seriously assist you in your combat efforts. Now, picking Stigmata is usually a tough challenge, but they’re usually designed to work well no matter what they’re paired with. Just keep the characters’ skills and general attack style in mind when picking. You don’t want your defensive, heavy-swinging Himeko sporting your burst attack-crit Stigma while your quick, agile, and precise-striking Mei and Yae Sakura use defensive, HP-boosting Stigmata. It’ll work, but not as well as it could, especially if you are fighting enemies which these applications may not go over well with. Phew! Now let’s talk Weapons. You can’t switch these out… You just cant. Sorry, but Mei won’t be swinging around a 7-foot block of metal, and Himeko won’t be dashing around swishing around with a Katana anytime soon. But Weapons have their own special qualities to add to the pile. Most have Weapon Skills – Activate-able abilities which can deal damage, stun, or sometimes carry away enemies. On top of their abilities, Weapons can be upgraded to increase their Base Stats (Such as ATK and CRT). As you upgrade weapons, the caps to which you can enhance these stats also increase. Among the highest caps, upgrades, and costs (but also the most powerful) are 5-Star Weapons. Most commonly acquired through Supplies, or through High-Level Event Missions like the Gluttony series. Weapons and Stigmata are also enhanced using separate materials. You can use Weapon materials to enhance Stigmata, but you won’t receive the bonus EXP you would normally get when applied to Weapons. “Now, we can begin to talk about how to actually PLAY the game, right?” Ha-ha, you silly newbie, you! Not quite! …Right, point is, you gotta know your stuff, and know how to use that stuff. 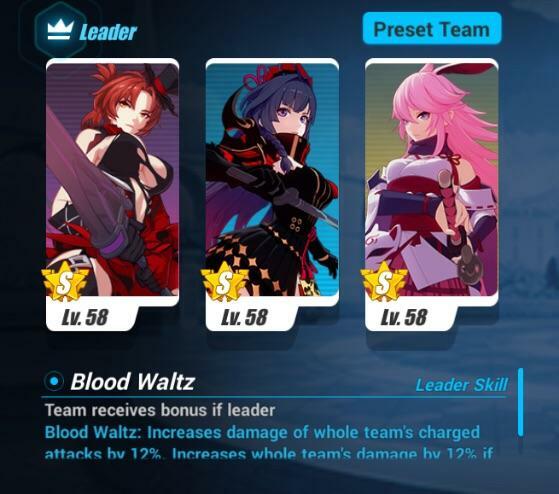 More important things to know about Honkai Impact are the Valkyries and their specific play-styles, abilities, uses, and combos. So let’s go over those qualities. Let’s say you want to learn how to play a brand new Valkyrie. In this case, we’ll pretend it’s Yae Sakura. We’ll be using her as our example for the rest of the section. Unlocked and upgraded using the most fragments out of any other valkyrie is Yae Sakura. Her combat capability is virtually unparalleled with regards to crowd-controlling, bursting, fast-paced and rapid-fire jump-dash-and-sprint insanity. I know, it’s amazing. But let’s try to stay calm. The excitement can continue in battle. First, let’s look at skills. (The) Passive Skill – This Skill is completely automatic, and gives you different effects once activated (some Passive Skills are always active). Most Valkyries have more than one Passive. In the case of Yae Sakura, her Main Passive is Sakura Brand, a more complex ability I will go over later. Evasion Skill – There are two types of Evasion Skills: The (Basic) Evasion Skill, and the Ultimate Evasion Skill. Evasions are essentially dashes or dodges which give a small span of invulnerability and move you out of the way of incoming attacks. While some of these Ultimate Evasion Skills activate Time Fracture (slowed time for surrounding enemies), others, like Yae Sakura’s, instead apply different bonuses, effects, or damages to different targets. Basic Evasions do not hold an specific quality or effect, and are activated by pressing the Evasion Button while the Ultimate Evasion is on cooldown (Ultimate Evasion automatically replaces the Basic when off cooldown). Special Attack Skill(s) – A unique ability which allows for more expanded options during combat, typically Combos. Can be activated manually or automatically, and varies accordingly. Now let’s go into play-styles. You see, understanding a play style before you actually play it can be surprisingly more effective at learning to master a Valkyrie than just going in and playing it. Of course, just knowing a play style won’t make you good at them, but it will make it much easier for you to acquire the physical skills needed to play them well. Just to clarify, this guide (and for the most part, NO guide) can directly make you a better player just from the get-go. No matter what, you will need to practice at least once to actually use the very skills you can learn here. That’s part of being human, sorry. But that doesn’t mean a guide won’t make you better faster than you normally might grow accustomed. So let’s practice this together, shall we? Part of Honkai Impact’s whole foundation is learning the different nuances that separate each individual characteristic of each individual character, not to mention the qualities of enemies that set them each apart. So let’s talk about some of the basics of a few of the Valkyries. The very first ranged character you unlock is Bronya, the cannon-wielding drill-hair sporting loli. As a fundamental rule of Bronya, you shouldn’t get too close. Maintaining distance is essential, and depending on your Weapons and Stigmata — determinate of your fate. There are different “Types” available for Bronya that you can choose from, but aside from the default Psychic-Type Bronya, you have to unlock them. As far as the Psychic Bronya goes, you’re a fantastic support, with decent damage output and incredibly helpful utility abilities. Use her as a switch in between your main damage-dealers to stack some serious damage in bursts in groups of enemies. Similar to Bronya, Kiana has different Types available to unlock. UNLIKE Bronya, the different types are all quite unique with their abilities (Mostly). There is a Creature, the Default Mecha, Psychic, and ranged-support Mecha Kiana. The default Mecha is simple, fluid, and has a nice tendency to smash creature enemies (which she counters). Her Ultimate can knock back/stun enemies nearby, has a high SP requirement but low cost, and gives a significant physical damage, shield damage, and range boost for as long as your SP lasts during the Ultimate’s drain effect. She is a very good starter for Mecha-Type, but loses her competitive edge to the more intensive burst-damagers like Shadow Dash Mei and Mecha Himeko later on. She won’t ever be bad, but may not always be the best choice in your lineup. It all depends on whether or not you want consistent crowd-control, or high-damage burst. For the most part, though, Kiana is effective at “Bob-and-weave” tactics. Going into a fight, and dodging frequently in between attacking combos to prevent counter attacking is typically the most common way to play her, as her main Combo has good damage, but isn’t very effective at repetitive attacking, since the enemy usually doesn’t just stand there and let you pummel them (unless you’re using your Ultimate, in which case, pummel away. They can’t stop you). Psychic Kiana is very similar to the Mecha Kiana, except instead of sheer damage she makes up for it in healing and utility. Her Ultimate is like the Mecha, but since her combo is a spin-kick instead of a launch-SMASH, it knocks the enemy into the air and pushes them away, before landing a finishing kick for large damage and keeping them fallen over. Her Ultimate and switch skills heal your entire team, and continue to heal even when another Valkyrie is switched in combat, only to stop healing when her SP inevitably runs out. The Creature Kiana has a bit more range, similar combos, but sparkly wings and anime powers. Her Ultimate causes her to spin in a tornado, spraying out continuous bolts of damage that lock onto enemies around her and consistently tear away at their health. She can perform excellently as a support, but also can do well as a main damage-dealer, just not as capable at tanking damage as someone like Himeko, and not as easily able to avoid it as Yae or Mei. All in all, a fantastic team-fighter and must-have for Friend Support and Co-op battles. The kind, careful, fast-moving idol of St. Freya’s (A name unmistakably a referential nod by MiHoyo to a certain anime) and the heroic goddess of Kiana’s Senpai dreams. Also maybe has lightning Herrscher (Lawmaker) powers that are super cool and electric and stuff. Plus some of the best ultimates in the game. And is an experimental project or something. Haha yeah, that WOULD be weird… Right? But that’s all besides the point. Her play styles differ more than any other Valkyrie between her Type-Alternatives. For instance, her Creature-type relies on close-up, fast basic attacks and combos to whittle down the enemy health bar, and an ultimate that slashed through lines of enemies for tremendous repeat damage. Her Mecha relies on quick movements, Shadow Clones from her Evasion and Ultimate Skills, and high-alpha bursts between dashes to shred creature-types and knock enemies airborne for perfect Switch Skill combos and stacks upon stacks of big scary numbers above any opponent’s head. In the event you have to face a corrupt Shadow Dash enemy, your only hope of survival is to spam abilities and Evasion skills that stun her or freeze her in some way to be able to get enough damage in to take her down. If you can’t do that, then you’re in for quite the challenge. When playing Shadow Dash, she deals increased percentages of damage bonus when striking from behind, so breaking through an enemy shield, knocking them airborne, and repeatedly going back and forth between the front and back of them, dashing then hitting and dashing then hitting, you’ll find satisfaction watching their health bar vaporize. During Co-op battles, her unique Team Skill gives significant damage increase to all attacks from behind, and goes to stack with your already-great Backstab damage, so you’ll “usually” finish MVP against Creature enemy swarms. It will also “basically” instantly regenerate all your health when combined with Kiana’s Psychic Team Skill. Just keep in mind: Shadow Dash is NOT invincible. Just because you can sweep across the map and vaporize exposed, unshielded enemy health bars does NOT mean you can do ONLY that and get away with it against challenging opponents. Without defensive Stigmata, you might easily end up vaporizing your own health bar while you were too busy watching enemy health bars disappear. Keep careful forethought in mind when “diving in” as Shadow Dash. Her Evasion doesn’t actually give you two dashes like other Mei counterparts do. It only offers one long dash and a quick-but-sluggish cool-down which can quickly doom you if you need to dodge before you get stunned and clapped harder than a floor mat covered with dust on a Sunday. Her Ultimate and Switch Skills are pretty much the same, differing only by intensity (obviously). When activated, her Ultimate freezes the battlefield momentarily, as she prepares herself and deals AoE damage to everything in the vicinity, and marking them for increased elemental damage. Then, she leaps into the air, launches every enemy (up to a certain maximum number) nearby in the air, and dashes through them repeatedly as they helplessly hover midair until she finishes, slamming them into the ground and creating a finishing AoE explosion of lightning on her landing zone. Her Switch Skill skips the preparation and immediately strikes them in the air, before dropping them down and dealing a little bit of damage for good measure. It’s sleek, it’s beautiful, and it causes enough numbers to appear for you to think you’re at a slot machine instead of playing the best game on the app store. Playing her is simple: Basic Attack with a little bit of Combo thrown in until the enemy strikes, then dodge, activating your Evasion Skill. Follow up with your retaliatory Special Attack, maybe spice it up with an Ultimate or a Switch if you feel like it. Beware, however: Lightning Empress Mei is a Glass Cannon. She’ll dominate the battlefield and zap swaths of Mecha-Types into oblivion, but if you aren’t careful, you’ll find yourself looking at a revival prompt wondering how your life’s mistakes led you to this moment. … Yeah I guess you’re right. Okay! Where to begin? Well, uh… You know that attack button? Bottom right of the screen? Big, glow-y… Makes you attack? Yeah okay good. Just press on that, hold it, and press it some more. When you see something threaten you with slapping your combo away you press the button at them and forget they existed. Okay, maybe it isn’t that simple, but that IS the general idea. Your Basic Attacks do consistent, moderate-to-high damage and (depending on the Type of the Himeko you’re playing) will also demolish their shield. Holding down the Attack Button will perform a Charged Attack, which deals more damage in exchange for time and a moment of vulnerability to attack. Once charged, however, Mecha Himeko will deal a short-ranged shockwave of damage, gain increased mobility and deal something around a metric tonne of damage to enemy shields before launching them airborne if the shield goes down (pretty much an unofficial 99% Chance it will if it’s Creature-Type). For the Creature-Types, the B-Rank “Starter” Himeko will do pretty much the same thing, and the other one will do a nice swinging roundabout-jab. Blood Rose, on the other hand, will instead do a cleave, an upward sweep, and then an aerial “CARTWHEEL OF DEATH” before slam-dunking the target full-tilt. In fact, when using her Ultimate, Himeko will gladly perform a circus ritual of summoning the demon of “R3KT” by spinning… And spinning… And BAM! Doomsday. Playing Blood Rose is a little different from the rest. She’s less of a “Tank and slash everything at once” and more of a “focus one target down into ash”. I’m sure you can draw an idea of gameplay from that plus her appearance. Now, to finish up this guide I’ll be discussing Lineups. Every time you “Begin Preparation” for a stage, you’ve just entered the most important phase in the entire game. Your preparation can be either the difference between 112,000 DMG in Co-op and 113,000, or it can mean the difference between Victory and your first-time 15 crystals and a revival screen paired along your bedroom wall with a new hole in it. First of all, knowing what you’re up against is exactly what you need to consider when picking a lineup. A true Chad will bring their A-Team every time (unless there is a mission for using a specific Valkyrie). It is best to bring an assortment able to counter anything it comes up against. Which means bringing one Psychic, one Creature, and one Mecha Type (You can easily identify Type by the color of the character background or the symbol associated with their Type). Know your enemy. If you do, counter it. If you don’t, prepare for all options. Know yourself. Choose your most capable Valkyries that you know you will be able to do well with, and ensure they all have the necessary Stigmata and Weapons, as well as Skills upgraded to the best of your ability. Will this Lineup have difficulty in any specific areas? (I.e. Crowd Control, Burst, Survivability, Utility, Etc.) If so, what can you do to help negate or completely eliminate the weakness(es)? After thoroughly answering these questions for yourself, try to think of anything else you might be missing or are in search for, and accommodate accordingly. In Honkai, Skill will win you battles, but preparation will win you wars. And in conclusion, keep in mind that the game has its own built-in academy to learn things firsthand and even earn some crystals along the way! You can find it at the Menu by pressing in the Ai-Chan icon in the bottom right.